Let’s Consume More Than We Produce! “Whatever it takes” stimulus by the state’s fiscal and monetary authorities has many victims. That includes, or course, historical principles of sustainable capitalist finance and sound money. But one of the most crucial is common sense itself. Consider the repeated refrain in the Mainstream Media that trade statistics for 2018 denote a strong economy. Indeed, we’ve been told you can get ever richer by going broke. Trump embarrassed on trade – President Trump based his campaign on reversing the nation’s trade deficit, a dubious pledge given the deficit usually reflects a strong economy. But now he’s going to have defend the fact that the deficit with China hit a new record in 2018. The overall trade deficit of $621 billion was the highest since 2008. The blithering ignorance is on full display in the phrase “given the deficit usually reflects a strong economy.” It’s also a weak swipe at the Donald. The good news is we have evidence. That’s the conclusion after four decades of “bigger and better” trade deficits. 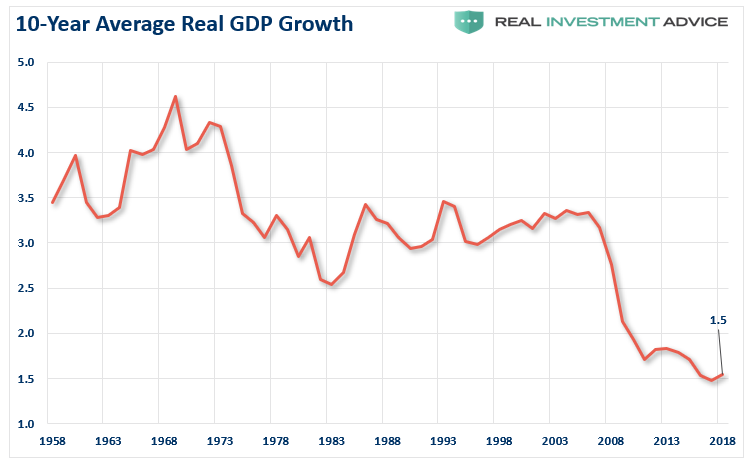 The real annual growth rate for gross domestic product (GDP) on a rolling 10-year trend basis has fallen from postwar heyday rates of 3% to 4% to only 1.5%. It’s so abysmal that we never got that low even during the 1930s. So, yeah, it’s worse than the Great Depression. We’re not talking about short-term, point-to-point deltas you can cherry-pick just to prove a point. There are few things more robust than a 10-year rolling average stretched over the course of seven decades. They’re ignoring the compelling evidence of the last 70 years. If soaring trade deficits reflect a booming economy, how is the “boom” being financed? Common sense tells you a boom financed 100% by rising employment and productivity is a wholly different kettle of fish than one financed 100% by debt and rising leverage ratios. Our leverage ratio – that’s public and private debt divided by national income – has erupted by two full turns of debt. In plain language – and by today’s economic scale – that amounts to $40 trillion. The debt-to-income ratio for the U.S. in 1971 was 1.48 times. Today, it’s 3.47 times. That 3.47 times leverage ratio is the corollary to America’s soaring trade deficits. Cheap central bank credit and sustained interest-rate repression have enabled the U.S. economy to live way beyond its means for decades. We’ve consumed more than we’ve produced, year-in and year-out, while borrowing the difference. That, again, is an honest market-based system.